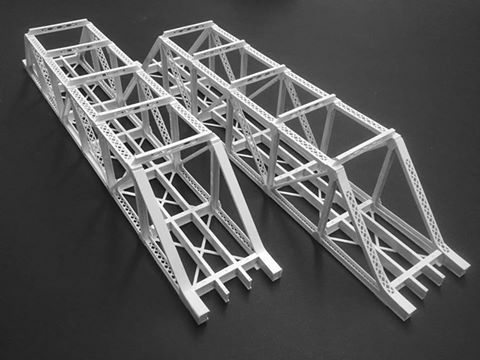 Both versions of this Warren Truss Bridge are available at the same price each. Shipping not included in the price. 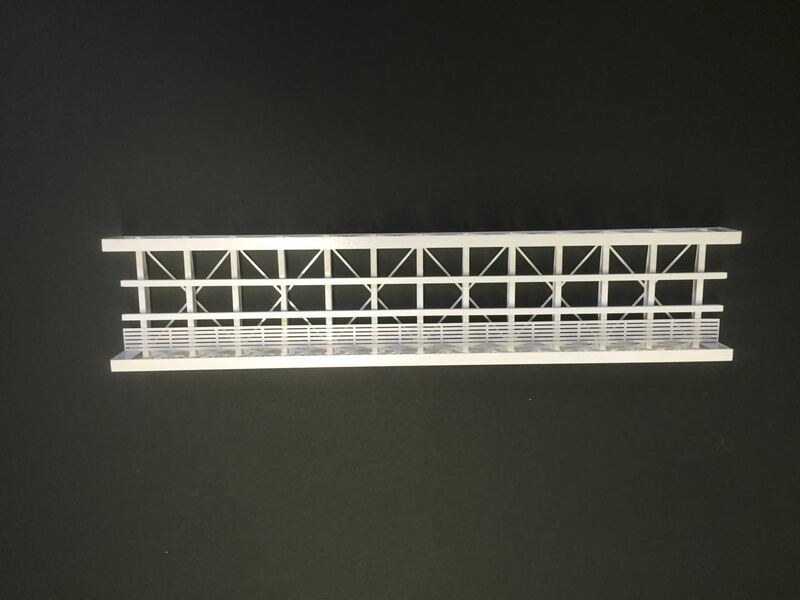 These highly detailed bridge models are constructed from styrene sheet that is cut on a numerically controlled milling machine. They represent a typical truss bridge on a SAR branch line, and come in two versions, one with full lattice girders, and version two, with plate girders and sections, representing a bridge that can carry a heavier load. The through girders that carry the track are designed for HOn3.5 track (12mm) but can accept normal HO track. The bridges are 396mm long, and the through dimensions are 48mm wide and 55mm high. (Excluding the height of the track). Included are the bridges footings, grown in ABS plastic. They come painted in red oxide colour, but on special request can be supplied in silver finish. These highly detailed models are constructed from styrene sheet that is cut on a numerically controlled milling machine. They represent a typical pony truss bridge on a SAR branch line. The through girders that carry the track are designed for HOn3.5 track (12mm) but can accept normal HO track. The bridges are 296mm long and 48mm wide. (Excluding the height of the track). Included are the bridges footings, grown in ABS plastic.